The video opens with the narrator and David Crystal elaborating on Shakespeare’s Globe Theatre “which opened in 1994 very near to its former site.” It was built much like how historians assume The Globe was originally so to “recreate the theatre as it was in 1600.” Of course, in achieving this authentic representation, we must now overlook and ignore the added stage lighting, exit signs, etc., (because, of course, these things were not part of the original) to have an authentic Globe experience. But what initially caught my ear was Ben Crystal’s assertion that using the original pronunciation in a performance “transports you back through the centuries….” His statement suggests that there is some way to experience “Shakespeare” as one would have 400 years ago. Now, not only is there no uniform “Shakespearean experience” for the people of the late 16th and early 17th centuries, but also there is no way to achieve or revive this authentic experience. For everything we study about Elizabethan England is necessarily rooted in our present day experiences and perspectives; consequently, our understanding of Shakespeare, his plays, the Elizabethan era, etc., is not so much historical as it is modern. We approach any sort of primary source (which, of course, represents a particular perspective, with a particular agenda, and not a universal standard of the time) not with a clean slate, but with a perspective that has been molded and influenced by a variety of narratives, each with particular interests. Our assumptions about and interpretations of the social and political atmosphere of the time reflect our current interests and not necessarily those of the period. The mere fact that we talk about these things as if they are static and definitive makes evident that we are working within a modern perspective; otherwise, these things would not exist. They only exist inasmuch as we can look back on them and create trends over time, and therefore, narratives. Much the same can be said for the way our Capstone Men and Women tell the history of the Alabama Crimson Tide football team as they pass by the Quad (and former football field) where I work. They tell a great story about our humble beginnings playing Birmingham high schools and how our success today is necessarily dependent on our tradition of hard work and dedication. 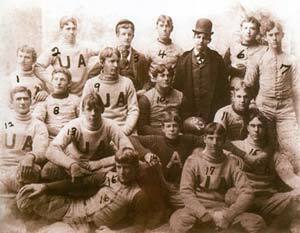 From that, the University is able to create a particular image and history of “who we are.” Of course, this notion of “tradition” is entirely dependent on promoting how we see and portray ourselves today, not as much about those young men playing against the Birmingham high school in 1892. With that in mind, our attempts at authenticating and recreating this original Shakespearean experience can be seen as being far more about “us” (whoever that is) and less about the plays. The “experience” we’re aiming for is created by us and how we choose to pay attention to certain aspects–the way we want to see the history, the way we want certain things to be relevant. 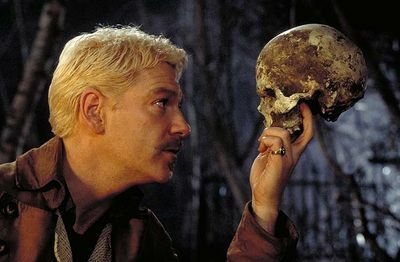 Employing the authoritative OP does not give us greater insight to the plays, Shakespeare’s intent, or some ahistorical connectedness; rather, it is us ascribing meaning, relevance, and importance to Shakespeare, which, in turn, reaffirms and reproduces the ideas of a particular working social group. In creating meaning and relevance, we therefore overlook the discrepancies that don’t fit so that we can create a strategic, historical narrative that reaffirms our own telling and creates a stronger sense of who “we” are because/in spite of that. This entry was posted in Grad Blog, Relevance of Humanities, Religion in Culture and tagged Alabama Football, Andie Alexander, Authenticity, Experience, History, Identity, Myth, Narrative, Origins, Shakespeare, Tradition by Andie Alexander. Bookmark the permalink.